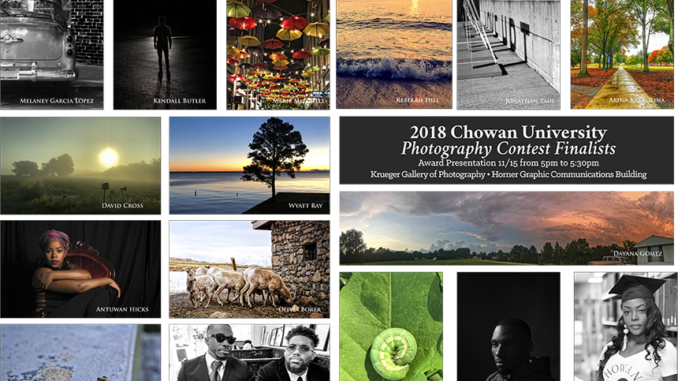 Join us on Thursday, November 15 at 5:00 p.m. for the 5th Annual Chowan University Photography Competition Awards Presentation and Exhibition in Krueger Gallery of Photography in the Horner Graphic Communications Building. Award winners will be announced at 5:15 p.m. Entries were juried by Sam Hughes, M.F.A., Assistant Professor of the Visual and Performing Arts Division of Fine Arts at Norfolk State University.